Meet Megan Heeder, a member of the Barton Community here at Walker Center. She moved into the intentional community last summer and lives in the Hume House. Currently, Megan studies at Boston College, and has plans to go to Marquette University in the fall to pursue a PhD in theological aesthetics. Theological aesthetics, Megan says, is the art and music aspects of the mass. Music, she says is what made her fall in love with her faith and better understand her Roman Catholic spirituality. 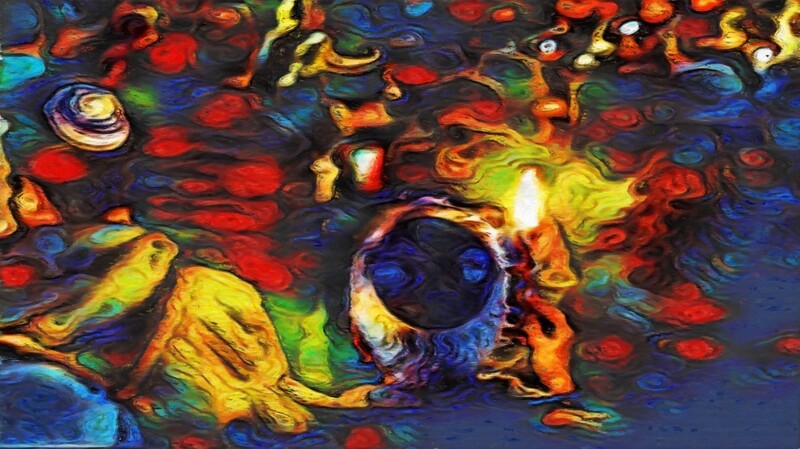 Both music and art play a huge role in aligning her spiritual and academic interests. “I love music both as an art form unto itself and in the context of mass,” she says. As the race gets closer, Megan spends some of her days wrapped up in nerves, while other days she feels ready to run her best race. Throughout her training, she has gotten to run in all kinds of weather conditions, and has gotten to test out almost every leg of the race track thanks to Walker Center’s location. The biggest consistency throughout her training has been her attitude. “I’ve tried to take everything in stride,” Megan says. She is confident at this point that she will run the race she is meant to this Patriot’s Day. Her housemates and the rest of the Barton Community are all getting excited watch her from the sidelines on Monday morning, and everyone at Walker Center is proud of Megan’s hard work both inside and outside of the classroom. As she enters into the last few days before the race, and as she enters into her last few months at Boston College before heading off to pursue her PhD, we are overjoyed to celebrate Megan’s accomplishments. Best of luck Megan, we’re all cheering for you! For me, listening to renowned religious educator Parker Palmer speak is a balm for the spirit. This is especially the case today, in a world obsessed with doing and achieving, rushing face downwards from one activity, or distraction, to the next. Especially in the present age of truncated conversations, and reactionary responses to bombardments from other mini-monologues--an age where the languages of venom, self-absorption, and violence have become part of the lingua franca. Palmer has a way of cutting through all of this noise and clatter. One of Palmer’s oldest and most famous quotations - one that I return to often when I consider the Walker Center and its mission - is this: “To teach is to create a space, in which obedience to truth is practiced.” (From To Know as We are Known.) To me, this means that we often grow as human beings best when someone takes the time and care to make room for a community of practice to develop, where we can engage each other authentically. Walker Center has long been a home, a conference center, a dinner table, a refuge, a place for workshops, a place of retreat and rest. It has been all of these things and more, for missionaries, religious leaders, families, students, nonprofits, community organizations, interreligious organizations, and so many others. Serving as a director here for these past four years, it has been a joy just to be a student of the Center’s history as a place where “spaces” are made, and communities are formed and shaped. Yet as I read old notes, letters, reports, and published articles, I note that there has often been a felt tension -- between the feeling of being a place of retreat and housing, and a place of learning and training. Which should be our primary focus? Certainly the former has proven to be a consistent thread throughout our history. You will still hear the “spirit of Eliza [Walker]” be referenced here; this is about a spirit of radical welcome and of hospitality. Preserving this uniquely-welcoming space, and this spirit that pervades it, is therefore something we certainly care about. But this has never been about pure self-preservation. And as Palmer makes clear, space--in the physical, as well as in the social, relational, and psychological, sense--is fundamental to the ongoing nurture of our identity, our belonging, our believing, and our capacity to act on behalf of others. 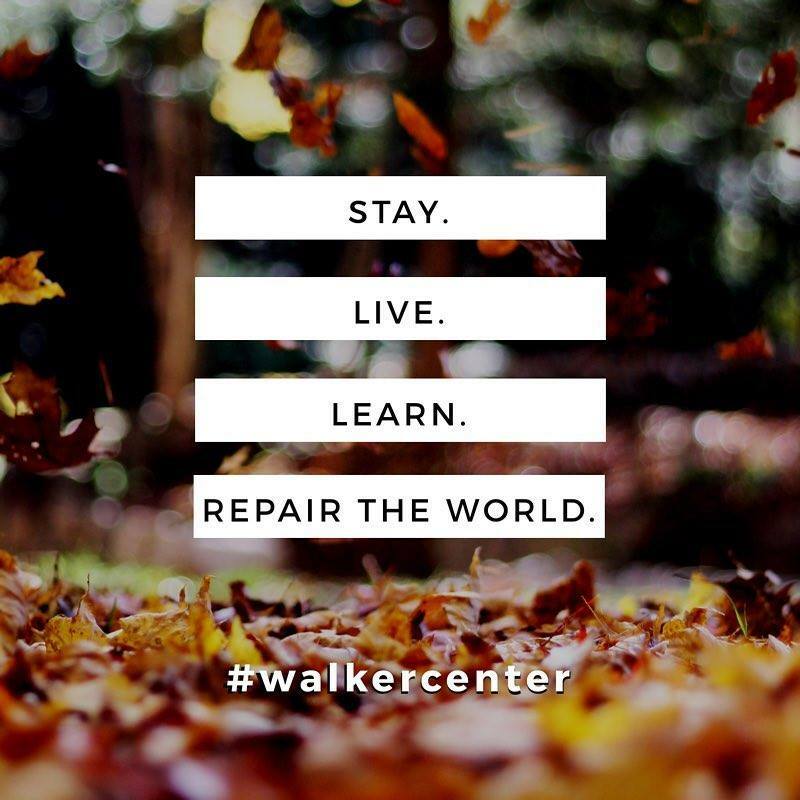 To be a place of rest and connection, and a place of learning and development, indeed go hand in hand--and Walker Center is a living monument to this truth. In this day and age, as all matters of “space” (for ourselves, and for others) become increasingly rare in our daily lives, and as the cacophony of violence often rings far too loudly, Walker Center remains committed to space-creation. It has been, and continues to be, part of who we are. Yet this is not simply a way to explain our past and present; it helps guide our future as a center of living and learning together. You might have noticed that last year we adopted a new logo that features the Walker House’s uniquely-designed front entrance. More than than our Colonial Revival architecture, we want our building to be known as a safe and creative space for communities to grow. But the implied light emanating from (and into) the windows and doors, along with the constant openness of that door in the logo which opens up into the world, are critical details! Because the communities that are formed and shaped here are always informed by, and seek to make a difference in, the world beyond our quirky, beautiful buildings. We do not control where the light comes from, or where it goes -- but we can help nurture conditions for the light to coalesce and intensify, so that it will shine ever brighter in communities across the nation and globe. This is how we strive to live out Palmer’s notion, to help contribute to a world with more "revolutionary love" in it, in our own small way. So if you are a “leader” (however you define this) in your religious community (or know someone who is), and looking for connections and for resources, so that your community can shine brighter and contribute more fully to a worldwide spiritual movement of love, you’ve come to the right place! Contact us, or check out our website, to learn more - and we look forward to announcing future plans very soon! * The clip is from last year’s (2018) Revolutionary Love Conference. If you haven't already seen it, enjoy. Also, the date this is being written (April 5th) marks the start of this year’s conference! 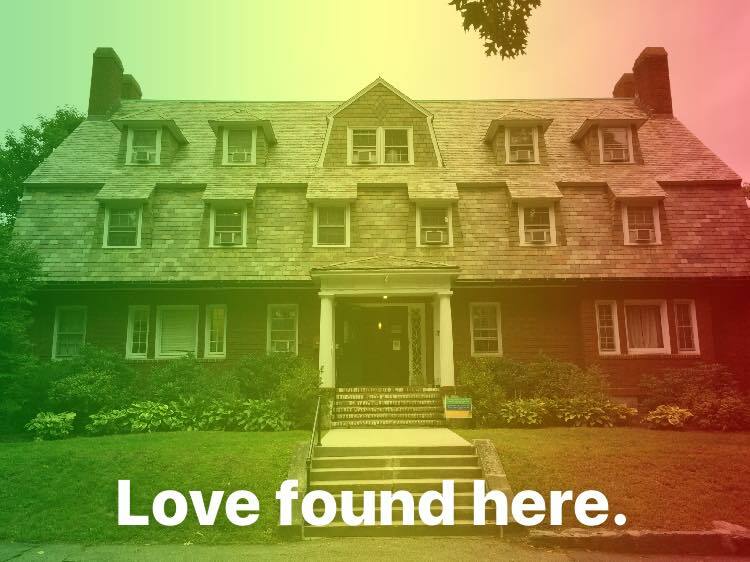 We’re thinking and praying for everyone there this weekend, and are so thankful for that beautiful space and community which Middle Church and the Revolutionary Love Project (led by Valarie Kaur!) have helped to create. To watch LIVE, and/or to register for next year’s conference, click here. Carol Zahra Lee, M. Div., is a local Sufi leader for the Shadhiliyya Sufi Center. Her title as Sufi minister is murabbi rahi, or “caretaker of the soul.” The Shadhiliyya Sufi Center is a national organization, but Carol is leader for the Northeast region. 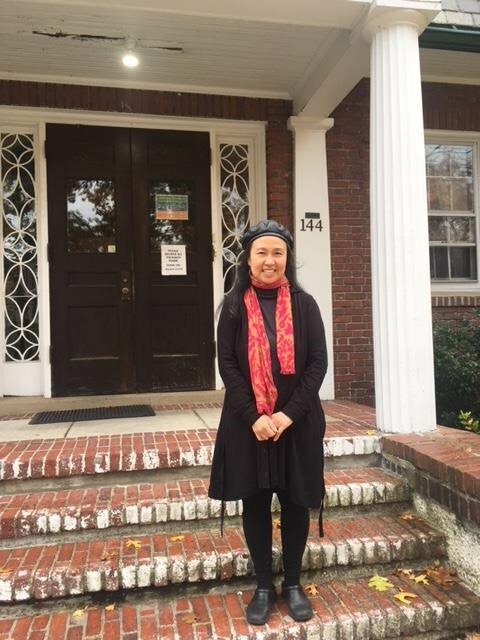 In early August, she held the Boston-area Sufi retreat here at the Walker Center. According to Carol, the retreat exists to help people slow down and reconnect with their Source. People come from all over the country - and some even from outside of the country - to receive spiritual guidance, pastoral counseling, and inner healing. Carol has been hosting “Sufi school” here in Boston for twelve years, but 2018 was their first year at The Walker Center. The group had been meeting at Andover-Newton Theological Seminary, which closed in 2017. After the closure, the group was in need of a welcoming space that could accommodate Sufi practices, such as a halal diet, a room for prayer five times a day, and space for an overnight prayer vigil. Luckily, they were able to easily switch their retreat location to the Walker Center. Carol spoke with pride about the retreat. It was evident that those who attended left with a sense of inner spiritual renewal and a deeper connection to God. This retreat is one of three hosted by the Shadhiliyya Sufi Center all across the U.S. There is one in Boston, one in Pennsylvania, and one in Texas. Carol explained that these local events are good for people who have families or don’t have the time or money to travel to the Mother Center in California. They provide a point of access for people to receive healing, have spiritual questions answered, and be in community together. Twelve years ago, when the retreat first started, the group had trouble finding an affordable space is Boston. Many organizations charged for their rooms by the hour, which would have made affording their overnight prayer vigil virtually impossible. Carol shared how she had prayed for a place to find. She remembers looking into 24 different places in Boston before finding Andover-Newton. After their closure, Carol was happy to have The Walker Center as an alternative space that her organization could afford. 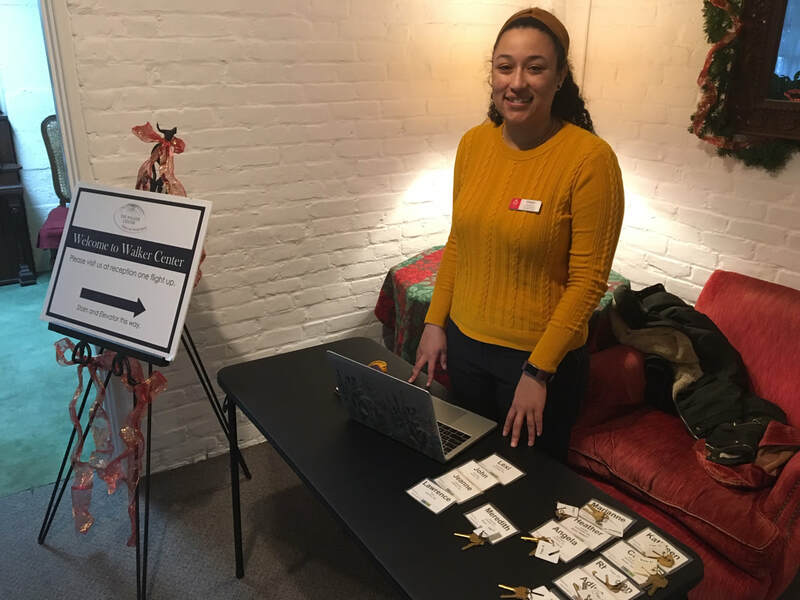 Chanel Gomez waits to greet participants for an Our Whole Lives workshop on Jan. 25. Meet Chanel Gomez - a young professional working for the Unitarian Universalist Association (UUA). She is the Events Coordinator for the New England region, which includes six northeastern states including Massachusetts. That means she helps organize major events like leadership development workshops and trainings on Our Whole Lives (OWL) - a curriculum for healthy sexual ethics. According to Chanel, these events are specifically geared toward ministers and other people in positions of influence in their congregations. The goal is to build healthy and well-rounded leaders in all UU churches. “That sounds like me,” she thought. After an event, part of Chanel’s job is to review surveys. She is encouraged to see that in the feedback, many people write that they are energized by those types of workshops. Chanel’s long-term goal is go back to school for policy. For now she is fulfilled by her role of helping organize these hard, but necessary conversations in the UUA. “Everyone I work with - one of the questions they ask is which is really fascinating to me is, ‘How do we do this job [of addressing white supremacy] better’? So that’s something we’re constantly having conversations about... We do a lot of learning. We do a lot of self-teaching. We bring in a lot of people who have those different perspectives, and we try to have a conversation about race, which is not easy, but it’s interesting." We are humbled to know that many of these conversations are happening inside our four walls here at Walker Center. Thank you Chanel and the UUA for all you are doing to build a more just and peaceful world! In 2019, Walker Center will celebrate its 149th year of hospitality, service, and mission. We do so, even as hostility, violence, oppression, and hatred permeate our screens, and our minds -- and as the struggle to balance daily life, or even just to live at all, leads to further and further isolation from each other. Here at Walker, we support and celebrate all the manifold ways faith communities and others resist the dehumanizing aspects of the world today -- from activism to prayer, from shouting to silence, and everything in between. In fact, we see our primary role in all of this is to facilitate the energizing, enlivening, and empowering of faith leaders and communities who are participating, or want to participate, in such resistances. This past year we have affirmed this calling, with the adoption of a renewed mission statement: We foster ecumenical and interfaith communities where people are educated and empowered to work for peace and justice. In short, we aim to support and resource "Communities of Light" - a name we have come up with for our 2018 end-of-year campaign. It describes that experience that most of us have probably had at some point in their lives - when people gather in love and have a transformative experience together that provokes thought and awakens the heart, that directly informs action in the world. At Walker Center, we create and support these kinds of communities, whether the communities themselves are short, medium, or long-term. In the coming days and weeks, we will be sharing stories of those whose lives and work have been impacted here. And with your support and encouragement, we aim to do more of this in 2019. Loneliness and isolation are the precursors for hatred and injustice. Creating and supporting transformative community is, indeed, critical to sustained resistance. That's why we will continue to offer support for partnered organizations' conferences, retreats, and other programs. And in 2019, we will be providing more opportunities for interfaith leaders and communities to come together, to become more connected and better equipped for the task of tikkum olam, the "repair of the world." Check out our end-of-year "Communities of Light" letter (PDF). Support Walker Center's new programming and outreach efforts with an end-of-year gift! If you're a faith leader of any kind, take a five-minute survey to help us learn more about you. Join our mailing list, and like us on Facebook, to stay up-to-date about what's happening at Walker. Our second "Walker Spotlight" story is about Kelly Kossar, a Rabbinical student at Hebrew College. 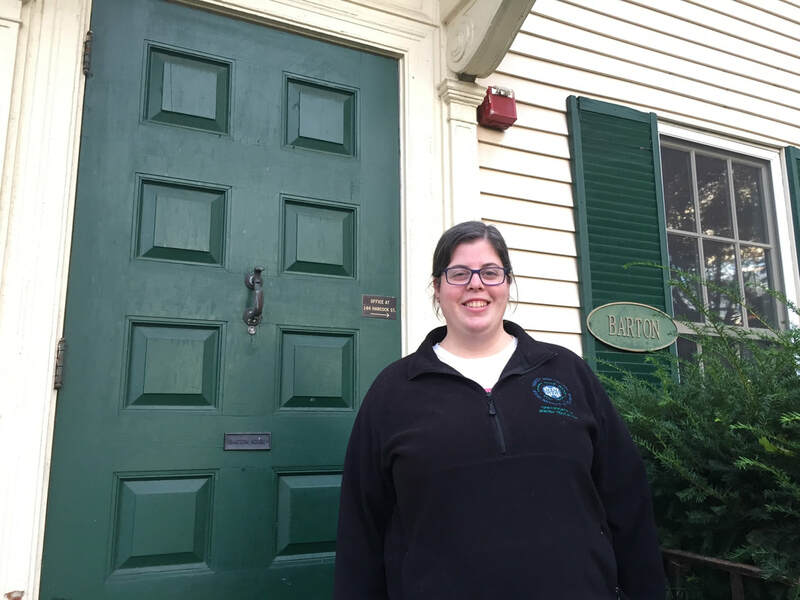 Kelly moved to Barton House three years ago, and when the Barton Interfaith Leadership Program began in 2017, she immediately took on a leadership role as the first Barton Fellow. She is still serving in that role, via organizing potlucks, bringing in speakers, and creating opportunities for interfaith dialogue in the house. "For me it’s been really healthy to live in a community that’s not [only] Jewish. It’s a taste of the real world, because the real world is not all [one religion] - it’s interfaith." 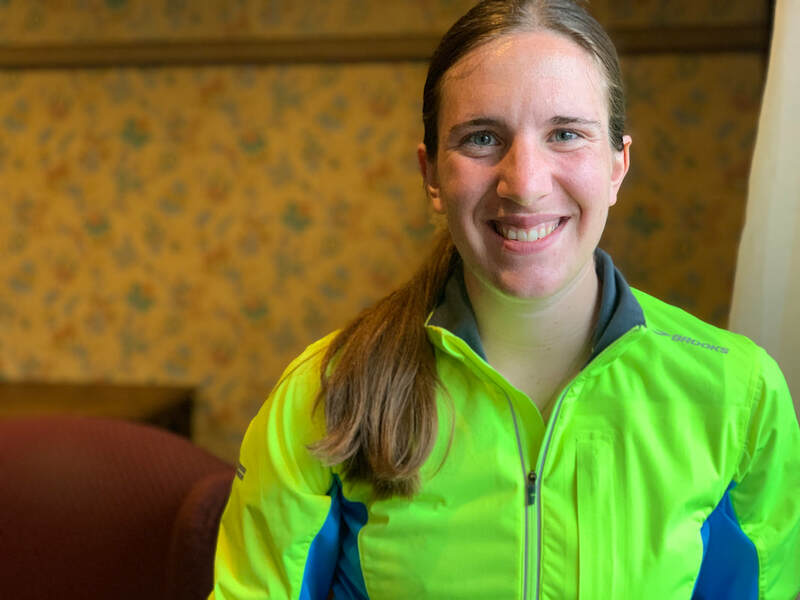 After living in an ecumenical setting, Kelly has decided to apply to chaplaincy programs that will teach her how to minister to people of all faiths and backgrounds - not just those who identify as Jewish. Living at the Walker Center has been integral to this career decision. 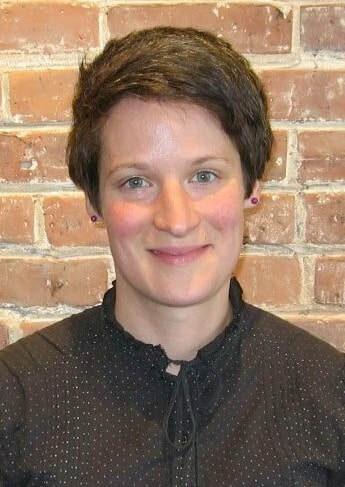 We are so excited to see the communities of light Kelly will create and nurture as a rabbi, and the many lives she will change through her commitment to peace, justice, and interfaith unity. 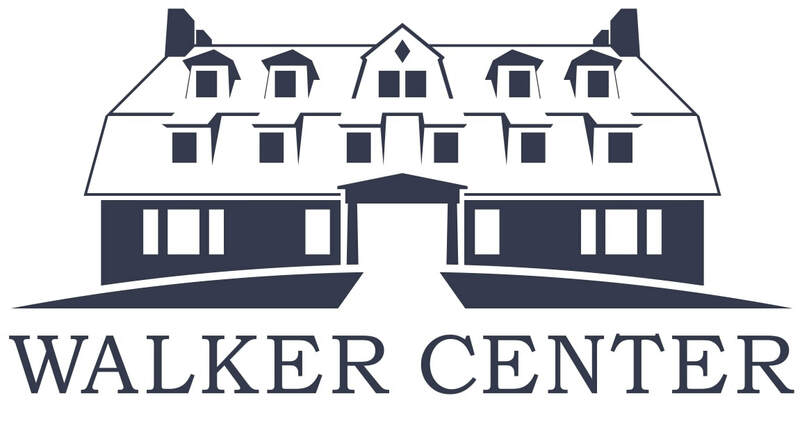 Welcome to the first "Walker Spotlight" feature, where we will be telling the stories of the people and communities that call Walker Center home, and who make us who we are. We hope these stories inspire you, as well as illuminate the need for places like Walker Center which foster and empower such amazing people to make a difference. Enjoy! Anju Lamichhane has lived in Barton House, our interfaith community, for just over a year. 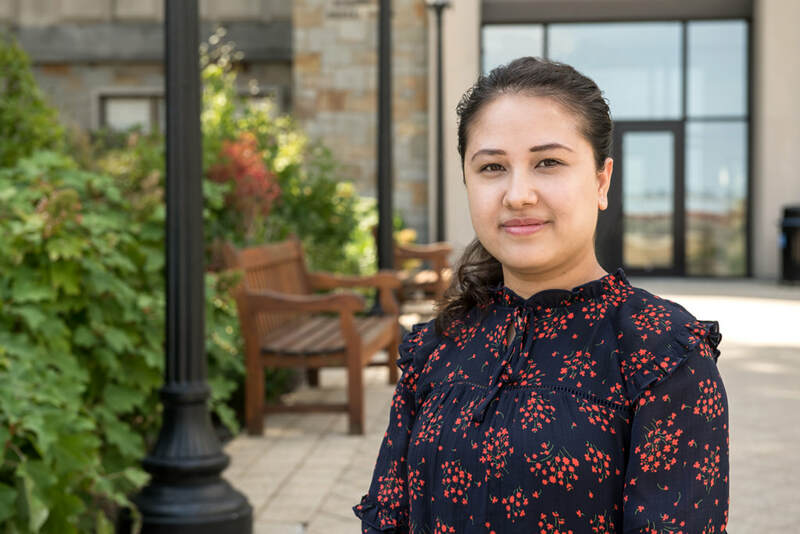 She immigrated to the U.S. alone three and a half years ago from Nepal to pursue higher education. She is now working on her second Master’s degree, an M.A. in Social Work with a Global Practice concentration, at Boston College. Anju found Walker Center through a friend from church who knew she was looking for community. Since coming to Barton House, she has never felt more comfortable living in the states. “The community and the people here have helped me have a good time in America and not feel like I’m an outsider all the time,” she said. Anju came she finally found the support she longed for in Barton House. She now has housemates who will check in on her, and she can talk with them when she’s going through a hard time in school. The events and workshops, she said, have taught her about “loving yourself, taking care of yourself, and how to contribute to society." Having this emotionally and mentally-supportive environment allows her focus more on her studies without the added pressure of adjusting to a new place. If you live in an apartment, who cares what you are doing in the next apartment?...Here, this is not an apartment, this is home. People care for each other. ​Living with people of other faiths and backgrounds has also helped Anju feel more a part of U.S. culture. In Nepal, a primarily Hindu and Buddhist country, Anju knew very few people who identified with a Western religion. In fact, before living in Barton House, she had never heard of Judaism before. Now, she has Jewish and Muslim friends for the first time, and she feels comfortable enough to ask questions and learn about their religion. Having roommates from the South, the Midwest, and the Northeast, she has a chance to learn about different American subcultures. She has also learned about LGBT terminology for the first time. “The biggest thing I’m happy about is that I’m not just living with other international students,” she said. “Here, now that I’m living with Americans themselves, I don’t have fear of approaching Americans anymore.” All these things, she said, will make her a better social worker when she goes back to Nepal. Anju shared that for most international students, moving to the U.S. is a tough transition. There are so many things they have to learn, including how to open a bank account, find housing, find roommates, and pay the rent. All these things affect their semester and how well they are able to focus. Oftentimes, international students struggle, Anju said, but because they have no community, no one knows about that struggle. Anju is grateful for the community she has found in Barton House. “I’m so happy that I can focus more on my studies and now worry about how to adjust in the United States anymore,” she said. “I’ve dreamed of studying social work since I was in 11th grade. Barton House has helped me with my dream." ​A woman in her 90s. An 88 year old jokester. A family doctor. Two “inseparable” brothers who faced mental challenges and were unwavering volunteers. A couple married at Tree of Life over 60 years’ ago. A researcher at Pitt’s Learning Research and Development Center. A dentist and runner. A youth coach. These eleven lives were taken from Pittsburgh’s Tree of Life community, indeed from all of us, on Saturday. 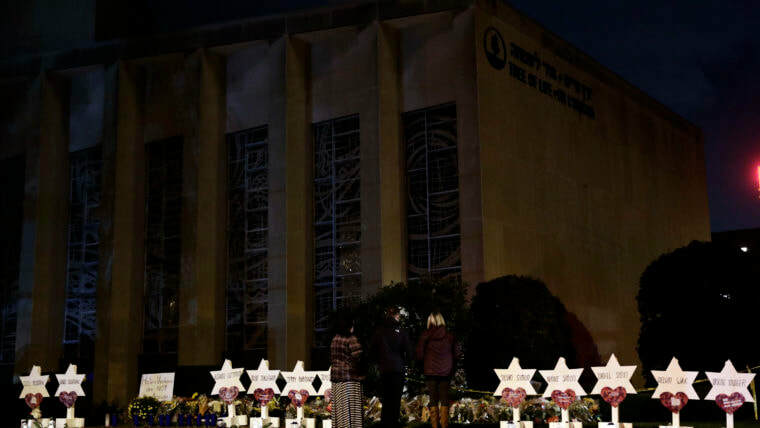 Add this to the 57% increase in anti-Semitic incidents in the U.S. in 2017 (following a 34% increase in 2016), mostly on school and college campuses – and it is clear that we are well beyond the point now of ever attempting to categorize what happened on Saturday as an isolated, apolitical incident. The last statements of the shooter make clear that he was only the latest violent example of the online-supported nationalist radicalization that has infiltrated our lives and our entire globe. This radicalization, despite the times where it co-opts the language of faith, is antithetical to the definition of faith that we uphold at Walker Center: a spiritual connection and commitment to the Divine, to our world, and to our fellow humanity, that finds concrete expression and through various religious traditions—and which must therefore shape our practices towards the common good, and our political (i.e., for the sake of the polis) aspirations towards justice and equality. For the eleven people above, and all who were injured and scarred by Saturday's attack, faith was and is an important part of their lives. Faith contributed to their community becoming a target of violence. Tree of Life is a spiritual home, where people live out their commitment to the G_d of the Torah and to their neighbors, through the love and life they share. Even if they do not all believe the same things, in a world full of hatred faith still brought them together, and provided a place where their love could be activated and their hope renewed. Such love and hope threaten hate. Right now, I don’t know if any of us have a foolproof plan on how to combat the world-wide nationalist fervor that is feeding some of our nation’s darkest legacies (of Anti-Semitism, anti-immigrant, anti-black, anti-LGBTQ, anti-indigenous, etc.) and encouraging them out of the shadows. All I know is that, as the rabbi says, we have to chase such darkness away with light – the all-embracing light of faith. We must commit to greater study and understanding, and to more direct action, in order to fight these dangerous trends. Through it all, we must commit to each other, to our own spiritual homes, and to our interfaith sisters and brothers. We must continue to gather together to pray, learn, sing, and love – to find our bread for the journey. Here, our prayers and thoughts will remain with Tree of Life, long after the news outlets have moved on. And to all the faith and interfaith communities who call Walker a spiritual home away from home, who in spite of the landscape continue to chase darkness away with light -- we send you all our heartfelt gratitude and love today. Keep fighting, and keep shining.